Today we would like to welcome Sara Sheridan to Historical Tapestry, for another post in our Why I Love series. Please see below for details of Sara's recently released novel The Secret Mandarin, and leave a comment for your chance to win a special prize pack. The winner will be announced on September 26. Welcome Sara! I must be the biggest swot ever! My idea of a dream day is to spend as much time as I like in the library – not my local lending library (probably my second choice) but the National Library of Scotland (NLS), which has one of the world’s most exciting archives. You can’t take any books out of the building at the NLS, but you can order anything in the collection to be brought up from the vaults (set in Edinburgh’s Old Town, the library is over nine storeys high and also comprises off-site storage). Like the Bodlian in Oxford and the British Library in London, it contains a copy of every book published and a huge collection of newspapers on microfiche. But there’s more! The archive material in storage includes papers of all kinds – letters, diaries and notebooks donated and bought over hundreds of years. If you want to see Byron’s correspondence with his publisher, John Murray, or the private diary of Sir Charles Malcolm (who ran the Indian Navy in the early 1800s) or the early photograph albums of the Edinburgh Calotype Club (the first photographic club ever), then the NLS is the place to go. It’s free and provides open access (though you do need to register for a reader’s card). There is something unbelievably exciting about that kind of material. There is a common perception that every document available has been trawled by historians and academics and that all the details are already known. The sheer volume of what is on offer belies that possibility – there are millions and millions of items and often when I am browsing items from the catalogue, I realise that the letters I am holding in my hands haven’t been read by anyone for a hundred years or more. It makes the history very real – the thick, faded paper, the franked stamps, the browning ink and the crazy handwriting. Tiny details bring the people to life – a concern over what to order for dinner or whether to travel in one coach or another give a real feel for what was on someone’s mind (sometimes in the face of large scale historical events.) To me, it feels like diving for treasure. Recently I found a letter from Haines, the Captain of a ship that the subject of my next book (James Raymond Wellsted) was commissioned to. He mentions Wellsted – ‘I was so hurt by Wellsted,’ the sentence starts, and here I can scarcely breath for excitement. I have been trawling the archives (not only in Edinburgh but in London) for weeks and weeks. That’s the thing about treasure – it’s rare. I’ve read diaries and letters for days without seeing a mention of my man. Just as important, the Georgians are dreadful at expressing their feelings – so this sentence really stops me in my tracks. I read it again, ‘I was so hurt by Wellsted…when he…’ It’s agonising but I can’t make it out. Captain Haines’s writing is appalling. I rush over to the nearest archivist. ‘Can you help me,’ I babble, ‘I just can’t quite read what this says….’ We puzzle for a good half hour but it’s no use – Haines’ is so moved by what he’s writing that the script has degenerated into an illegible scribble. In the end I photocopy the letter and I have been carrying it around for almost two months now, showing it to any librarian I come across. Someone, I am convinced, will be able to read it! Other times the treasure is easy pickings. Much of the day to day London life of Mary Penney, the main character in The Secret Mandarin, came from the diaries of actresses, like herself. They are frank about their expectations, their admirers and their interests and so I made Mary likewise. Robert Fortune, the botanist on whose journeys the book is based, published several memoirs of his travels in China and these contributed tremendously to my story. But, like much in life, the prizes hard won are the most exciting – seeing the herbarium specimens Fortune brought home from the east, with notes about them in his own handwriting, was genuinely moving. For me, there’s nothing like that feeling of getting close to someone who really made history – and that’s why I love old letters. They are as close as any of us is likely to get. 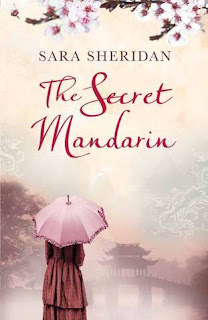 Sara Sheridan’s book The Secret Mandarin is published by HarperCollins on 17th September 2009. She is currently working on a follow up, this time set in the Arabian Peninsula, scheduled for publication in autumn 2010. 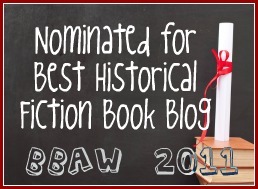 Sara’s website www.sarasheridan.co.uk contains a variety of resources for readers interested in historical fiction including a research page, a recommendations page, biographical information, interviews, reviews and topics for discussion for readers’ groups. Win a copy of The Secret Mandarin and some promotional freebies (cards of the cover, badge and a sample of a specially blended tea that is being made for the launch...) by leaving a comment about either the favourite letter you ever received, or a letter you would like to find in the archives. The prize is available worldwide. I think the favorite letter I ever received was from my boyfriend at the time. He never wrote letters - hadn't ever written one before, but he said our unfortunately long-distance relationship was like a really hard test, and he closed it with "I wanna pass". It made me giddily happy! PS- I adore these "Why I Love" posts- so wonderful to read! I think the best letter that I've ever received was one from my husband when we were dating (and it wasn't mailed, it was slipped into a package). The best letter I've ever received in the mail would have to be not one individual letter, but all of the letters from my grandma. She has a great sense of humor and her letters are always good for a chuckle. Was I suppose to leave my email too? ops..
My favorite letter is one I didn't actually receive, but one I inherited. I have the letter in which my great-grandfather proposed to my great-grandmother, written in 1869. It's full of quaint phrases, like "I have no flowery beds of ease to offer you". Great post, I'd love to win The Secret Mandarin. Lovely post! A couple of friends of mine and I love to exchange real letters. In this day and age it's so rare to get a physical letter. When this happens, and it's a good letter I keep it. I still have the first letter my husband wrote to me. Can you imagine the information gap in history we are going to have now that everything is digital? So sad. The best letter I ever received was the one announcing I had been accepted to graduate school. The best letter I ever received was actually a Christmas card from my brother in which he told me how proud he was to be my brother. I still have that card, and I look at it a few times a year. The best letter I have received was the one accepting my first short story for publication. I had received rejections before and always knew that if I got my SASE back I wasn't in. My husband called at work one day and said I had one of my SASEs and did I want him to open it. No, I did not. But he opened it anyway and said "This one's different. Let me see..." He really built up the tension and finally I lost my patience and said "Just start reading to me!" "Okay," he said, "'Dear author..." I don't remember what else it said. Wow, what a thrill. Definitely my letters were the ones I received from my grandparents. I wish I would have kept them all as all my g'parents have passed now. I have all the letters from my grandmother. She wrote to me in Maryland. I hated being away from family and I loved getting the letters. I still read them. I miss her and her stories of the 1940s. I love to research in archives--I was a history major in college--so I could just feel the excitement of finding that letter. :) I think the favorite letter I've ever received was in a birthday card from my grandmother. I saved it--just knowing she was thinking of me and that one day I won't have her around to call whenever I want to made me want to save it. She is so very special to me. The letter I received was after my mom had passed away. It was left to me and it was all about me being strong if anything ever happened to her. My mom was my rock... at the time of her passing whe was the only member of my immediate family I had left. At 29 years old.... that letter meant the world to me - and still does. I refer to in times that seem hard... she reminds me that I am strong and that she is proud of me. I would love to find some archive papers relating to my grandmother. I feel she had an interesting life, and although I know I could ask my mother and aunts about her, I would love to find something they dont know that could be a catalyst for a novel. For example I know she saved the life of her employer when she was a maid: she was dusting the fire and the lady of the house swished upto her and her skirts caught on fire, nan put them out! I know that this find wont happen for me, nan was in Durham, England and I am now in Adelaide, South Australia.